Because I love to snuggle up with a good book, I thought this might be appropriate for a cold winter's day. Complete with cozy throw and handy task lighting. All that's left to get, is a cup of coffee, and the tome of your choosing. Hope you are able to carve out a little time in your day that looks something like this. Enjoy! OH yes! Almost forgot! 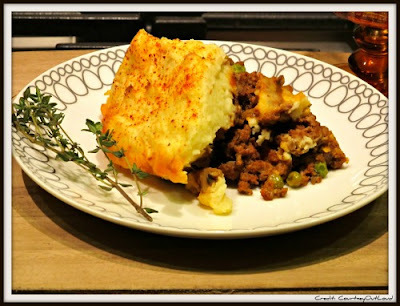 I HAVE to send a massive thank you out to my man Courtney for a stellar (with a capital S) recipe for Shepherd's Pie he posted on his blog a bit ago. I made it over the weekend and it was truly amazing (with a capital A!!!) I thought I might give a recommendation, and 2 forks up in case you all were looking for a perfect cozy dish, to go with your comfy nook. Yum!!!! LOL - thank you for the shout out! I am glad you liked it. This made my day! Oh this is SO me you have no idea! Black, white, gold, fur, glam, fur...they're all here! 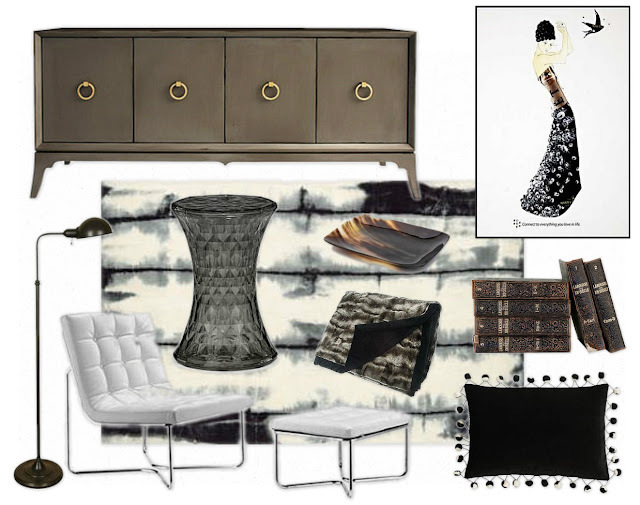 I love the rug and the console!